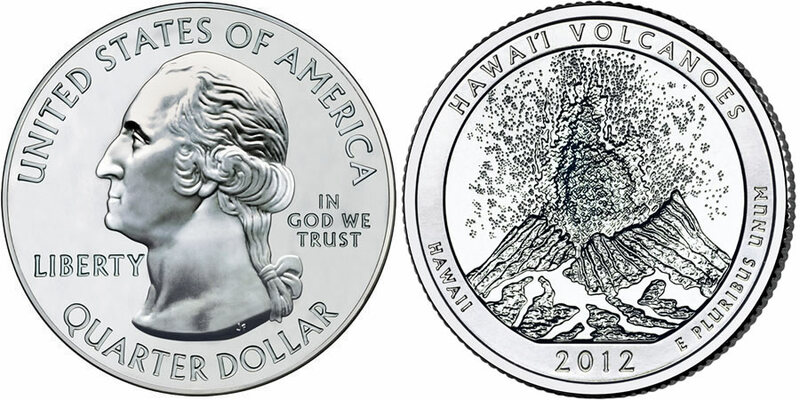 Appearing as the fourth of five 2012-dated releases of the US Mint's America the Beautiful Five Ounce Uncirculated Coin™ series is the 2012 Hawaii Volcanoes Silver Uncirculated Coin. The reverse of the coin contains a design emblematic of Hawaii Volcanoes National Park found in the state of Hawaii. This series of silver uncirculated coins is considered the numismatic versions of another set of strikes from the US Mint, the America the Beautiful Bullion Coins. Both series of coins are struck from five ounces of .999 fine silver with a diameter of three inches and both also feature reverse designs emblematic of selected sites of national interest from around the United States and its territories. The programs debuted with 2010-dated strikes and see five new strikes released annually as part of them until 2021 when the last strike of each series will be issued. Hawaii Volcanoes National Park is located in the state of Hawaii on the Big Island. The park was established on August 1, 1916 and today encompasses an area of over 500 square miles. John Flanagan's portrait of the first President of the United States, George Washington, is shown on the obverse of each America the Beautiful Coin. The portrait was first used on the 1932 circulating quarter and has been in use on the quarters in one form or another ever since. The obverse also contains the inscriptions of UNITED STATES OF AMERICA, LIBERTY, IN GOD WE TRUST and QUARTER DOLLAR. The reverse was designed and sculpted by United States Mint Sculptor-Engraver Charles L. Vickers to show an eruption occurring from the east rift of Kilauea Volcano. 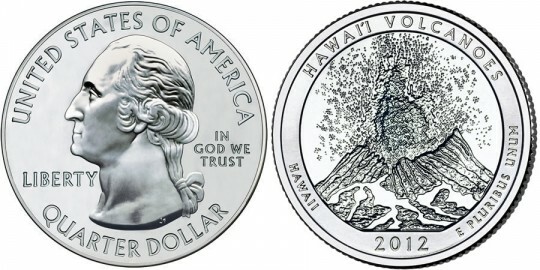 Reverse inscriptions on the coin include HAWAI'I VOLCANOES, HAWAII, 2012 and E PLURIBUS UNUM.